Events.biz, an online registration platform, is in dire need of an update. One of the first in the business of online registrations, the cloud-based program Event Builder is used by event directors to set up registration for marathons, bike races, triathlons, and more. However, while the software does its primary job fine (collecting registrant data), various updates have been tacked on causing major feature bloat along with inconsistency in function and design. Ease of use. Event directors vary from small business owners, non-profits, and volunteers. They all have one thing in common--they don't have time to research and learn a baroque new tool. Event Builder needed to be massively trimmed to just the most essential functions and then be able to perform them perfectly. Event directors need their most important data (Registrations and Revenue) in a convenient and logical place, with options to dive deeper. The following will mostly focus on the event dashboard, where data, marketing, and accounting information can be accessed quickly. I set about to redesign the event director dashboard. Each part of my redesign can be found below with details of my thought process for the design. The Main Menu on the top bar allows quick access to the different parts of the site pertaining to organization-level needs. When an event is opened from the home page, the left side event menu allows access to event-specific tools. Listing Strength is a percentage based on how well the user has taken advantage of the various tools of the software. It provides next steps for clients wondering what will make their event most successful. Various suggestions are offered, including “best practices” for a successful listing, as well as calls to action for additional marketing services. The Links section displays the most used links so that the user can easily navigate to all components of their online presence quickly. A stylized illustration of each type of page allows users to visually identify which site they want to go to. Through user testing, it was determined that sharing is the most common motivation to access links so a Share button was added in later drafts. 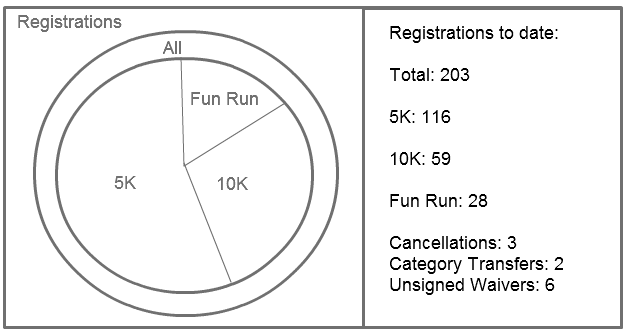 The Registrations Graph shows the amount of participants in each category. User can mouse over each slice of the pie chart for a breakdown of the various prices in that category. Clicking on the pie slice takes user to another page, where registrations over time as well as detailed demographics can be seen. The Revenue Graph shows revenue over time. Various views can be chosen, including: Monthly, Daily, By Price Point, etc. Mousing over a bar in the graph provides additional information. 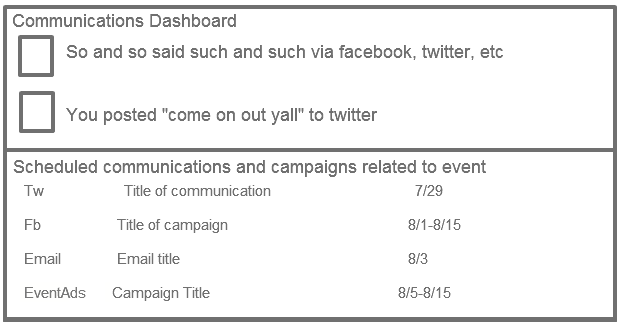 The Communications Dashboard shows recent activity on social media in the top section. This includes posts by the event director as well as others. Below, users can view upcoming campaigns and messages.